On a warm summer morning I headed up I80 on my way to a long-anticipated fishout. The first thing I encountered was a huge traffic Jam at 4:30 AM? "Hopefully," I mused, "this was not an omen!" I have never fished the Trinity River, but thanks to the PFF members I was already armed with enough knowledge to do well. After all the traffic delays, I finally got to the river at 9:30AM. The first thing I noticed was huge salmon leaping out of the water after flies, Wow! Then again another! The rest of the gang was not due to arrive for a while later, so why not, I went fishing. Since I was fishing a new piece of water, I decided to explore for a while. I saw a few fish being caught from a small pram, so I continued casting but the river was running high and fast in this section and I could not get out to where I wanted to be. 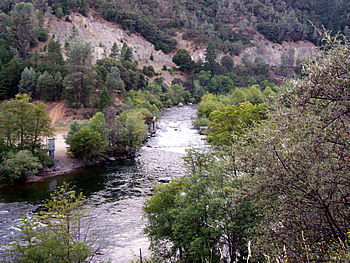 I hiked down the river a ways and ran into someone that was catching fish. He had a good spot for short line nymphing, and although the river was generally a bit high and fast, there were still many spots to fish if you could get a cast out to them. I tried a small Copper John as a dropper and presto I had a fish on. It was a bit on the small side but a fish is a fish. I finally found a great pool that I could wade out to with my walking stick and had a reasonable amount of room for a back cast. As you can probably tell by this point I was tired of roll casting and my fly selection was becoming slightly diminished. From my suggested reading and PFFer advice, I decided to tie on a couple of soft hackles and do the wet fly swing. This worked like a charm. I immediately started to hook into fish. 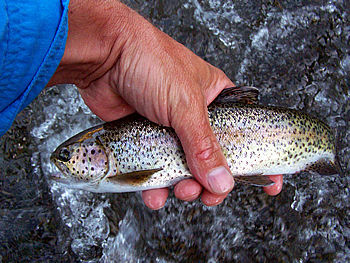 By the end of the day I had plucked 10+ 12"-14" trout from this single pool - all beautifully colored rainbows. It was true, according to what I had read, that the hook set had to be mild when using the wet fly swing. I left this spot and went exploring both catching and losing trout the rest of the day until almost dark. By 8:30 PM I was beat and satisfied with all the action I had that day. I never ran into Mike or Roger but I did see Mike's truck just before leaving. 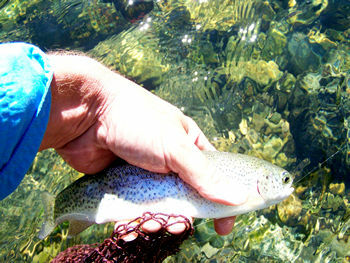 These trout really know how to fight; they seem to be on an oxygen high.